This utility is a Windows front-end for the DOS SDK tools: Conv3ds.exe, Convx.exe and Convxof.exe. The application was written using Visual Basic.NET, so you must have the .NET Framework installed to run this utility. (You can get the .NET Framework from the Windows Update site) See the readme.txt file included in the .zip file for more details. 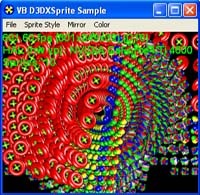 A Visual Basic 6 code module containing several D3DX8 helper functions. Many D3DX functions do not provide the result of their operation in the return value. This module is simply a wrapper to return the function parameters as return values. Using the D3DPOOL_SCRATCH flag introduced in DX8.1 has some cool benefits with D3DX. 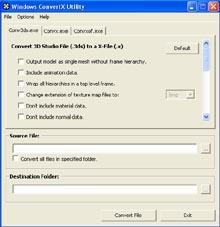 This sample shows you how to load a file into a texture object, create a mipmap chain, edit the filtering and resize the texture. 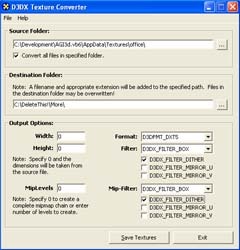 Then the texture can either be saved to a BMP file (no mipmaps) or a compressed DDS file; the program can even do an entire folder of files at once. Since we are using the scratch pool, we are not limited by the device on what formats we can support. Also, we don't have to limit ourselves to the REF device (this app uses HAL) for texture conversion. Demonstrates: D3DPOOL_SCRATCH , D3DX.CreateTextureFromFileEx, D3DX.SaveTextureToFile and simple device initialization. This sample demonstrates how to render text to a surface that can be mapped onto a quad in world space. Demonstrates: D3DX.CreateRenderToSurface, D3DX.CreateTexture and D3DX.CreateFont. Check out these VB adaptations of Rich's C++ Code to be included in his upcoming book for Addison-Wesley called The Direct3D Graphics Pipeline. Many thanks to Rich and Robert Dunlop for helping me convert the samples to Visual Basic 6 code. There are still more samples to come, so stay tuned! Content is not to be duplicated without permission from the authors. Source code for a minimal well-behaved Direct3D8 application. Source code for a minimal well-behaved Direct3D8 application, based on the DX 8.1 SDK framework. Based on the minimal application above, this program computes a chaotic orbit in 2D and displays the orbit as color coded points. The chaotic nature of the orbit makes each painting of the window's client area slightly different, appearing animated. This can be a very simple way to experiment with an animated effect without coding timers. Drag the window size handles and watch. The gingerbread man fractal enhanced with the DX 8.1 SDK framework. Unlike the 'minimal' style gingerbread man fractal above, this sample provides you with much more control over the rendering using the D3D framework: interactive device switching, a toggle from windowed mode to exclusive mode, start/stop and single-step the animation, FPS counter and other rendering statistics. Most of this comes from simply using the framework's implementation. Extending the framework to provide more GUI elements is as easy as adding some menu items and a command handler. You can watch the chaotic orbit in the plane as diffuse points or textured points. The points are rendered with alpha blending to allow them to accumulate to a dense image. The standard color chooser dialog is augmented with an alpha channel edit control, letting you edit all the colors used in the sample. (See the COLORSEL.DLL sample below for more details.) On-screen help, bounding box toggle, view animation, status display toggle, foreground and background color editing. 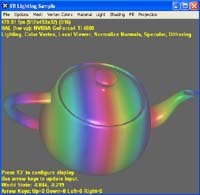 Demonstrates: diffuse colored points, texture creation, 2D texture coordinate generation, textured points, single stage texture setup, RGBA color picker, accumulating renderings in the back buffer, locking and filling vertex buffers, world transformation, simple camera animation, Direct3DVertexBuffer8, DrawPrimitive, DrawPrimitiveUP, ValidateDevice. Sample based on the DX 8.1 framework, the boiler plate classes that Microsoft uses for their DirectX SDK sample programs. This sample was started by using the 'New Sample Apprentice' (vb_Apprentice) below to generate a blank sample and then add demonstrations of D3DX.CreateBox, D3DX.CreateCylinder, D3DX.CreateSphere, D3DX.CreateTeapot and D3DX.CreateTorus. Interactive control over the detail of the generated mesh is provided through the arrow keys on the keyboard. 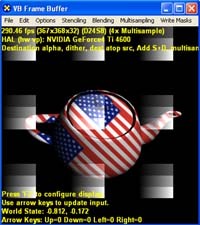 Demonstrates: device initialization, simple viewing, simple lighting, Z buffering, D3DX.CreateBox, D3DX.CreateCylinder, D3DX.CreateSphere, D3DX.CreateTeapot, D3DX.CreateTorus, D3DXMatrixLookAtLH, D3DXMatrixOrthoLH, D3DXMesh, D3DXBuffer, D3DXMesh.OptimizeInPlace. Demonstrates drawing text with D3DX. Screen-space text is drawn using D3DXFont. World space text is drawn as a mesh created as a 3D extruded character outline with D3DX.CreateText. The menus let you change what text is displayed each frame, alter the color of the displayed text, and select each method's font. Demonstrates: D3DXMatrixPerspectiveFovLH, D3DXMatrixOrthoLH, D3DX8.ComputeBoundingBoxFromMesh, D3DXMesh.OptimizeInPlace, D3DXMesh.CloneMeshFVF, D3DXMesh.GetVertexBuffer, D3DX8.TessellateNPatches, DXLockArray8, DXUnlockArray8, D3DLIGHT8, D3DMATERIAL8, Creating D3DX8 shapes, etc. Demonstrates: D3DRS_MULTISAMPLE_ANTIALIAS, D3DRS_MULTISAMPLE_MASK, D3DX8.CreateTorus, D3DX8.CreateTexture, Direct3DDevice.CreateImageSurface, D3DVertexBuffer8SetData, locking surfaces, matrix texture transforms, etc. What's an application apprentice? Well its a code generator that's not quite smart enough to be called an Application Wizard. The apprentice is a code generator, just like an AppWizard, but its just an extremely dumb code generator. All it knows how to do is make a new Direct3D sample from a template with your entered project name substituted in a few places. This is a simple vbscript program called vb_NewSample.vbs that prompts you for the name of a new sample and creates a blank sample of that name. 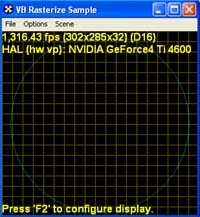 The generated sample does nothing but display some frame rate and device statistics. You can then modify the routines for creating device objects, rendering scenes, and so-on. The template is based on the D3D framework, like all the other Direct3D SDK samples, so your new sample will be based on that as well. Please note that framework is not intended to be a bona-fide application framework. Feel free to customize it to suit your needs. Note: This script presumes the presence of Windows Scripting Host on your computer. WSH is included with Windows 98/Me/2K/XP. Its available as a free download for Windows NT/95. See the readme.txt file included in the zip for more details on the VB script. Similar to the above example, yet this apprentice allows you to create a minimal Win32 C++ application, a minimal C++ console application, and a C++ screen saver; in addition to a Visual Basic 6 application. Instead of using VBScript, this apprentice is an HTA (HTML Application, requires IE5 or later) that lets you choose the new sample type. Note: Be sure to use a valid identifier for the project name (i.e. no spaces or other characters prohibited in identifiers) as the project name is substituted into pieces of code as an identifier in some instances. This sample can also be downloaded from Rich at http://www.xmission.com/~legalize/book/snippets/index.html#7. Do you need an easy way to select a color, without having to use the .OCX included with Visual Basic? The common dialog color picker does not provide a way to specify an alpha value! Besides, it returns the color bits in the incorrect order for setting Direct3D color values. Using our COLORSEL.DLL you can add a color picker to your application that has a text box where the alpha component can be specified. 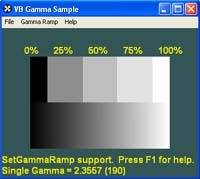 The color value usage is also compatible with Direct3D functions and methods. Note the Alpha text box to the left of the Lum: Text box. Includes a sample Visual Basic 6 application demonstrating the usage of the DLL, with full comments. This software comes with absolutely no warrantee and no guarantees as to fitness or correctness. "All it takes is for the rendered image to look right."